Preparation for any off-grid electric system (that is, one that's not connected to the local utility grid) begins with assessment and calculation of your energy needs. The primary tool used for this task is a Loads List . Start calculating your Loads List by clicking on the image above. 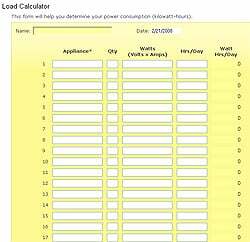 A loads list is simply a tally of all electrical loads that will be used in the completed system. Everything from lights, to television sets, to hairdryers, to cell phone chargers must be included on your list. 2. The total needed by all electrical devices at any given moment, in Watts. The difference between Power, expressed in , and Energy, expressed in , is a very important one. Power is an instantaneous measure of electrical supply; it's a rate , not a quantity . For example, a 15-Watt compact fluorescent lamp (CFL) requires an electrical power supply of 15 Watts to operate (often it is said to "draw" 15 Watts). It does not "consume" 15 Watts, since the Watt is not a measure of quantity. For quantities of electrical energy we use the Watt-hour, abbreviated Wh, and its big brother the kilowatt-hour (kWh) which is simply 1,000 Watt-hours. You may be familiar with the kilowatt-hour from your electric utility bills; it's the energy unit your bill is based on. As its name implies, the Watt-hour expresses "power across time", and can be calculated simply by multiplying the power figure (W) by the time figure, in hours; hence the name, Watt-hour. So our 15-Watt CFL uses 15 Watt-hours each hour. "The Wattage of light bulbs and CFLs is easy to obtain: look at the labels on the devices." To give you an idea, imagine that the 15-Watt CFL mentioned above was left on for 66 hours and 40 minutes. In that time, it would consume 1 kWh of energy. We know this because 1,000 (a kWh) divided by 15 (the power needed by the CFL) equals 66.67, which, in our equation, must be the hours figure. Remember: Power x Time = Energy. To complete a loads list, you will need to know the Wattage needed by every electrical device that will be used. The Wattage of light bulbs and CFLs is easy to obtain: look at the labels on the devices. Not all appliances list their power need on the label. That's often due to the fact that the device uses power differently at different times; an example is an electric range and oven. The power needed to operate it—and, consequently, how much energy it consumes over time—depends on how many burners are turned on, and to what settings, and whether the oven is on as well. Similarly, a refrigerator does not consume a steady amount of energy but actually cycles on and off throughout the day. (On average, a refrigerator "runs" about 13-15 hours per 24 hour day.) The only way to measure such devices' energy consumption is to track them over time and figure out a daily or monthly average. The Kill-A-Watt meter is an excellent tool you can use to measure the wattage of a device. So how do we do that? There are simple power and energy meters available that can do this task for you. Such meters are typically plugged into a wall outlet and the device to be measured is then plugged into the Kill A Watt meter . A display screen shows information about the device's use of electricity. Most meters of this type measure power drawn by the device (in Watts) and energy consumed over time (in Watt-hours and/or kWh). To measure the electricity used by the fridge, plug it into the meter and leave it plugged in for a week or a month. (The longer the time period, the more accurate the average will be). At the end of the time period, read the display and divide that figure by the time unit. Most meters will use hours. Knowing there are 24 hours in a day, you can then determine the average daily, weekly or monthly Wh or kWh energy consumption by simple arithmetic. The value of an accurate loads list for your off-grid system cannot be overstated. If you're off the grid, you must produce every Watt-hour that you need. A bad guess up front may mean insufficient energy when it counts. Even seemingly insignificant differences among devices can yield wildly different results when calculated over long periods of time. For example, if we had substituted an equivalent incandescent light bulb to our CFL above, and left the incandescent on for the same 66 hours and 40 minutes, it would use over 4 kilowatt-hours of electricity—four times the energy used by the comparable CFL! In preparing for an off-grid electric system, it absolutely pays to spend the time to measure or carefully estimate your intended loads. Not only will you ensure that you end up with a renewable energy system that meets your actual needs, you'll usually find ways to conserve energy or increase efficiency which reduces the size of the system you'll need. A smaller system is a more cost effective system and a loads list is the most important tool to get you there.